Craving pasta? This simple, flavorful recipe will do the trick with more nutritional value than traditional pasta noodles and far fewer calories at only 42 calories per cup. Spaghetti squash is a good source of b vitamins which help promote optimal cell function in the body, potassium, a mineral needed for proper nerve and muscle function. Heat oven to 425 F. Carefully split the spaghetti squash in half, lengthwise with a knife. Scoop out the seeds and discard. Season the squash with salt, pepper and olive oil. Place the squash cut-side down into a 13” X 9” baking dish. Bake for 30-40 minutes, until tender. Let cool until you can handle to scrape out the flesh with a fork. The pieces will look like pasta shape strands. In a saucepan, over medium heat, heat the oil. Add the onion and sauté for 5 minutes. Add the garlic, oregano, basil, salt and pepper, stirring for 1 minute. Add the cherry tomatoes and sauté 5 more minutes. Add the can of diced tomatoes, cook on a low simmer for 10-15 minutes. Taste for flavor and season accordingly. 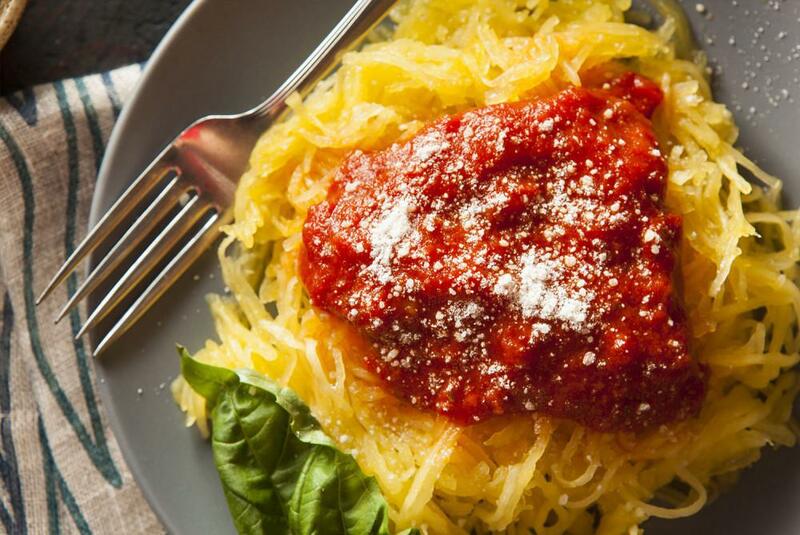 To plate the dish, top the spaghetti squash with marinara, sprinkle with parmesan cheese and chopped parsley.